A quick way to open the Disk Management utility in any version of Windows is from the Command Prompt. Just type a short command and the Disk Management utility starts instantly. 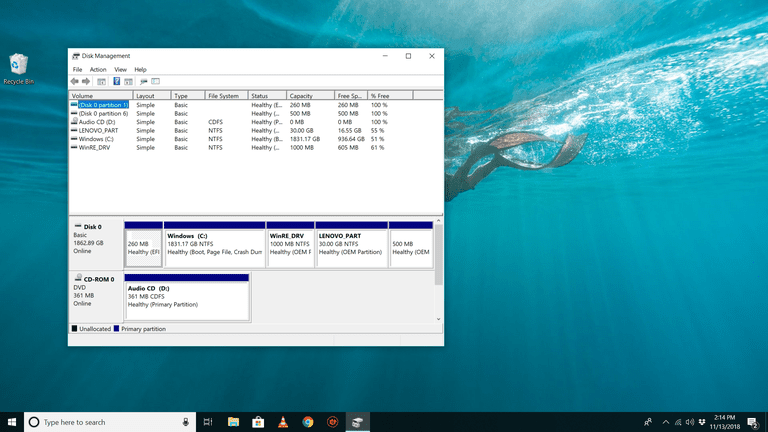 Disk Management is buried several layers deep in most versions of Windows, so having a faster way to access this super-tool for your hard drives and other storage devices can come in very handy. The Disk Management command is the same in all versions of Windows, so these instructions apply equally to Windows 10, Windows 8, Windows 7, Windows Vista, and Windows XP. Time Required: Opening Disk Management from the Command Prompt only takes several seconds, and probably much less once you learn the command. In Windows 10 and Windows 8, open Run from the Start menu or Apps screen (or see the A Quicker Method... section at the bottom of the page for an even faster way to get to Disk Management than using its command). In Windows 7 and Windows Vista, click Start. In Windows XP and earlier, click Start and then Run. All you're doing in this step is accessing a part of Windows that will let you use the command for Disk Management to search for and open the tool, as you'll see in the next step. It might seem odd that there are multiple ways to do this, but every version of Windows works a bit differently. ...and then hit the Enter key or press OK, depending on where you ran the command from. Technically, opening Disk Management from the Command Prompt would require that you actually open the Command Prompt program (which you can do if you want; it works the same way). However, running an executable program like diskmgmt.msc from the search or Run box accomplishes the same thing. Also, technically, diskmgmt.msc is not the "Disk Management command" any more than any non command-line tool's executable is a "command." In the strictest sense, diskmgmt.msc is just the Run command for the Disk Management program. Disk Management will open immediately. Now that Disk Management is open, you can use it to change drive letters, partition a drive, format a drive, and more. The method you use to open Disk Management doesn't change what you can do with it. In other words, all the same functions exist no matter which shortcut method you use to launch Disk Management, whether it be with Command Prompt, the Run dialog box, Computer Management, or even Windows Explorer. Are you using a keyboard or mouse with Windows 10 or Windows 8? If so, opening Disk Management via the Power User Menu is even faster than via its Run command. Just press the WIN and X keys together to bring up the menu, then click Disk Management. In Windows 10 and Windows 8.1, right-clicking the Start button works to bring up the Power User Menu, too. In Windows 10, you could also execute diskmgmt.msc directly from the Cortana interface, which is nice if you're used to using that to execute commands already. Another way to use the Disk Management command is from Task Manager. This definitely isn't a quicker method than the procedure described above, but it might be your only option if you're having troubles displaying the desktop or opening menus. To use the command for Disk Management in Task Manager, open Task Manager via Ctrl+Shift+Esc, and go to File > Run new task. Enter diskmgmt.msc and select OK. The Task Manager method is the exact same as using the Run dialog box. If you compare the two boxes, you'll notice that they look nearly the same because you're accessing the same function in Windows: the command line.